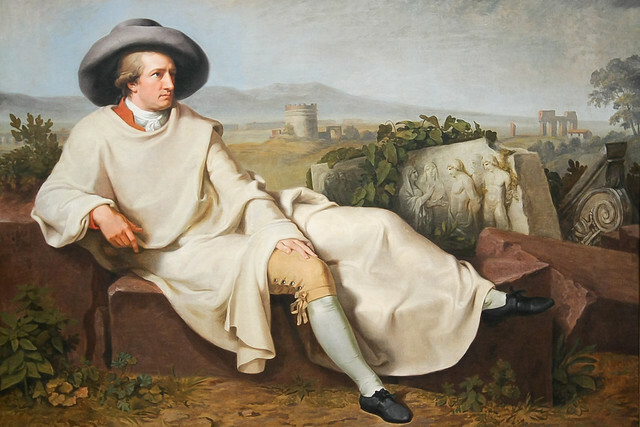 Johann Wolfgang von Goethe’s works have inspired us for almost 250 years. They speak to us today as freshly and as radically as they did in his own lifetime. This is partly thanks to the adaptation and reworking of Goethe's works by composers and writers including Mozart, Nietzsche, Beethoven, Freud, and Mahler; who were all influenced by the Frankfurt-born writer and ensured that they resonated in their own times. Two of history’s most popular French operas – Gounod’s Faust and Massenet’s Werther – are Goethe-inspired. Their two unhappy heroes live today through these operas as much as through Goethe’s words, communicating with us in ever-evolving ways. The eponymous characters Werther and Faust share a similar preoccupation: neither of them is very satisfied with life. Werther wishes the world approximated more to his ideal and Faust’s thirst after knowledge and new, more exciting experiences is never slaked. Both characters attempt suicide: one is ultimately successful; the other is averted by voices singing. Goethe’s first novel Die Leiden des jungen Werther (The Sorrows of Young Werther) is often credited as the first ‘psychological novel’, with the sensitive young hero enraptured by the wonders of the world but ultimately disappointed by its failure to live up to his ideals. Wracked with grief over the private and indulgent tragedy of his unsatisfied desires, Werther finds no alternative but self-destruction. Massenet’s opera highlighted the powerful relevance for fin-de-siècle Europe of this cautionary tale of the conflict between reason and passion. Just as Goethe had created a new genre in Werther, he sent the familiar Faust legend into unchartered territory in his most famous work, the verse drama Faust. Goethe invents the character of Gretchen, a figure who becomes so fraught with guilt that she refuses to escape to freedom with Faust. In Gounod’s opera, the helplessness of the human condition that Goethe explored clashed with the mid-19th-century vogue for the theatrical spectacle of human suffering. In Faust Goethe added a new element to Faust’s pact with the devil: if he, in his new life of adventure, becomes so utterly satisfied in any one moment that he would wish to remain in that moment forever, he will die at that moment. There’s possibly an echo of this in the way Massenet’s librettists altered the ending of Werther in their adaptation. In the novel Werther never knows of Charlotte’s love; unable to live without it, he takes his life. In the opera Charlotte rushes to the dying Werther and admits she really does love him. Perhaps for Werther the realization that he was deprived of what he wanted, but at least not rejected, was a moment that, were it to last forever, would be paradise, but in its transience is beautiful enough that one might immediately die. What sustains in both Werther and Faust – and the operas they inspired – is Goethe’s belief in the power and vitality of individual human experience. We must ‘dream big’ (for small dreams have no power to move the hearts of men); we must yearn for the impossible and seek after new and diverse experiences, rather than settle for dissatisfaction or imperfection within the constraints of arbitrary conventions. What has been accepted for a long time, or what remains of it, is not necessarily a comfortable paradise. But we can learn from both heroes that in the pursuit of our ideals we must be wise to the nature of our passions, for in self-destruction lies folly. Werther runs until 13 July 2016. Tickets are still available. Cinemas around the world will be showing encore performances of Werther until 27 August 2016. Find your nearest cinema. The production is generously sponsored by BB Energy and is given with generous philanthropic support from Mrs Susan A. Olde OBE, The Taylor Family Foundation, Susan and John Singer, Spindrift Al Swaidi and the Maestro's Circle. The production is owned by Paris Opéra. The War in Europe has been over for sixty years--I think it's time to bring Goethe back into American classrooms. American students are 26th in the World ranking for scholarship: What do we have to lose!